Charge-to-Charge is a patent pending solution that IFPL unveiled during APEX. As the name suggests, the new product enables an airline to monetize the USB power. There are two scenarios for a passenger to pay for USB inseat power inflight. 1) During the purchase of an airline ticket, a payment option to include for power during the flight may be selected. 2) Or via a preloaded mobile app, most likely the airline app, a passenger in route could elect to purchase inseat USB power. The USB outlet would communicate with the traveler’s PED via the app, allowing that device to be charged. IFPL also showcased a reversible power outlet that supports both USB-A to USB-C as many consumer electronics are making the transition from one standard to the other. The company is always innovative, and they also demonstrated a concept seatback 15-watt Qi wireless inductive charging feature. They anticipate certification for the product by year-end. BoardConnect Portable was the focal point for Lufthansa Systems during APEX. The next generation system is capable of streaming inflight entertainment content to 100 passengers, which is more than double its previous capacity. 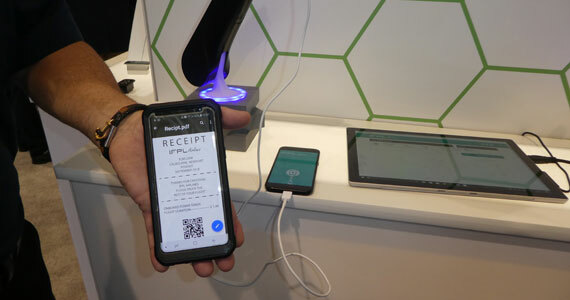 It can be combined with a product from Lufthansa Technik called BoardConnect Portable/Link that facilitates low bandwidth SMS messaging and real-time online payments during flight. Furthermore, the product needs an antenna but requires no STC! Operational health and usage statistics are also features that the new BoardConnect boasts. One of the forward-thinking technologies we experienced at APEX came from PDT/Astronics. They demoed a concept technology called LiFi. This wasn’t the first time we have heard about LiFi, far from it. However, it was the first time we experienced such a successful demonstration of the technology and we can see future applications for this technology inflight 5 or 10 years down the road. What is LiFi? LiFi is a high speed, bidirectional, and fully networked wireless communication of data using light. When an electrical current is applied to an LED light bulb, a stream of light (photons) is emitted from the bulb. LED bulbs are semiconductor devices, which means that the brightness of the light flowing through them can be changed at extremely high speeds, allowing a signal to be sent by modulating the light at different rates. The signal can be received by a detector which interprets the changes in light intensity as data. This cannot be seen by the human eye. This technique allows data to be transmitted to-from an LED light bulb at very high speeds. In fact, LiFi can get up to 11 Gbps, whereas, standard 802.11ad is in the 7Gbps range. LiFi only works for line of sight transmission but there is no interference with critical instrumentation. LiFi is significantly more secure than other wireless technologies because light can be contained in a physical space – physical barriers and adjustments can be implemented to contain and protect the light. It also works with 10%-90% light illumination. In other words, Li-Fi is rapidly modulated LED that has the capability to securely link a passenger’s PED well beyond traditional Wi-Fi. We realize it was a demo, but we watched a movie streamed via LiFi. There was virtually no latency and you could block the light, stopping the movie, and move your hand and the movie played right where we left off without any noticeable delay. We were impressed and cannot wait for this technology to be available in the home and in the air in the future! One of the reasons we so enjoy attending expos like APEX is having the opportunity to meet new entrants to the IFEC space. RebelRoam is one such company. The Estonian-based company has developed a smartphone app, dubbed RebelRocket, that addresses three issues: speed, cost, and security – all frequent issues affiliated with public Wi-Fi networks whether they be on the ground or airborne. Here is a broad view of how it works. First, the app automatically encrypts all the content secure to any public Wi-Fi network. Secondly malware and ads can be blocked which reduces webpage load time. Third, it also optimizes video streaming. In other words, the app enhances any connection made through any Wi-Fi network. This sounded like a pretty cool product to us and we expect to hear more from RebelRoam over the coming months! Kontron unveiled their portable Cab-n-Connect P100 wireless streaming platform for the commercial avionics market. The new platform is stated to be both flexible and robust while being in a small form factor (9.8 inches x 3.5 inches x 12.6 inches). It utilizes 802.11ac/abgn radios and features dual hot-swappable batteries to enable 12+ hours of streaming video. The P100 platform has up to 8 TB of onboard storage, as well as, RSSD for quick content updates. Immfly announced that they selected Kontron for the Pegasus Airlines wireless IFE program. The Turkish-based low-cost carrier selected Kontron to supply their A320 and B737 fleet (81 aircraft) with the ACE Flight 4600 airborne servers, RSSDs, CWAPS and installation kits. The company also inked a deal with Air Esurfing, a fully owned subsidiary of Air Media online Group, to jointly explore the China aviation Wi-Fi market. The Air Esurfing system solution plans to integrate Kontron’s ACE Flight Server and Cab-n-Connect WAPs for inflight connectivity application for China’s Ku-band and Ku/Ka-band HTS capacity. Astronics Corporation, a leading provider of advanced technologies for the global aerospace, defense and semiconductor industries, announced that its wholly owned subsidiary, Astronics AeroSat, had its FliteStream connectivity solutions tested, qualified, and approved to operate across Intelsat’s FlexExec business aviation service. Astronics Aerosat’s FliteStream connectivity solutions are the first inflight terminals to obtain approval to operate over Intelsat’s FlexExec service. FliteStream is a widely deployed satellite broadband data solution of fuselage- and tail-mount SATCOM products designed for government, commercial, business and VVIP aviation operators and passengers. Global content agency Spafax was nominated this week for two B2B Brave Awards, an initiative hosted by global media platform and Europe’s largest marketing website: The Drum. The B2B Brave Awards celebrate excellence in B2B campaigns produced for digital and Out-of-Home as well as strategic initiatives in data, artificial intelligence, PR, social media and more. The awards are judged by a panel who have extensive experience in the B2B industry, including representatives from Stein IAS, LinkedIn, IBM, Momentum Worldwide, Adobe, MRM McCann, Ogilvy and more. Powered by AI, the Spafax Profile with Amazon Alexa Skill that allows airline passengers to “ask Alexa” about what movies, television shows, and music will be available on board their upcoming flight. The first of its kind, the Skill was launched with American Airlines, who wanted to introduce a way for their customers to use their Alexa-enabled devices to plan their journey and get excited about the entertainment on their upcoming flight. Airbus has presented its new reliability analysis software at MRO Europe 2018. Called “Skywise Reliability”, this new solution has been developed by Airbus and is offered with Skywise Core. The application integrates all relevant fleet-wide data – such as part replacements, flight plans and delays and historical maintenance actions – and fully automates reliability reporting, saving airlines hours per week. Furthermore, it allows users to ‘drill down’ into trends to truly diagnose root causes so they can allocate resources to mitigate recurring operational interruptions (OIs). Skywise Reliability also complements internal data with worldwide anonymised fleet data so that airlines can proactively assess reliability performance against industry benchmarks and understand whether a recurring issue is unique or a more systematic issue. Thanks to Skywise Reliability, airlines have already reported that they can typically reduce the reliability process time from one week to one day – saving significant time in collecting / sorting / processing the data and producing reports. Since its launch in June 2018, 28 airlines have been connected to Skywise Reliability, including easyJet, Allegiant, WOW Air, Bangkok Airways, and Etihad. The service provides interactive and ready-to-use dashboards to simplify the reliability process and increase its efficiency. It allows users to measure in-service fleet performance, explore operational data and benchmark fleet data (eg. fleet utilisation, operational interruptions and in-service issues, LRU removals, logbook data etc.) with other operators and the worldwide Airbus fleet. Thanks to Skywise Reliability, airline engineers and technicians can easily set up alerts (for example on mean time between unscheduled removal (MTBUR) of a line-replaceable unit (LRU) versus guaranteed MTBUR), and analyse trends, build reliability reports and collaborate. Inmarsat, a provider of global mobile satellite communications, announced the appointment of Kai Tang as Senior Vice President of Business and General Aviation (BGA). Kai joins the Inmarsat Aviation business from Inmarsat Government, where he held the role of Chief Commercial Officer. Kai is an experienced satellite communications professional with industry expertise ranging across government, maritime and aviation. During his seven years at Inmarsat, he has held the role of Vice President of Commercial Strategy and Operations for Inmarsat’s U.S. Government Business Unit, and also played a key role within the company’s Global Xpress development programme. He will be responsible for Inmarsat’s ground-breaking portfolio of connectivity services for the business aviation industry, including its global, high-speed Jet ConneX inflight Wi-Fi solution, which delivers an in-the-air broadband experience comparable to on-the-ground connections. In addition, he will oversee next year’s business aviation launch of the European Aviation Network (EAN), the world’s first inflight broadband that combines dedicated satellite coverage with a complementary LTE-based ground network. SITA announced that it will deploy a further 15 Scan&Fly units at Kuala Lumpur International Airport Terminal 2 (klia2), following the successful implementation of 15 units earlier this year. Baggage processing time has been cut in half for AirAsia passengers using SITA’s Scan&Fly bag drop technology at klia2 terminal, taking between 30-40 seconds on average compared to 75 seconds previously and reducing the wait time for check-in by 40%. The addition of SITA Scan&Fly into the check-in process has resulted in dramatic improvements in the overall check-in times. Prior to implementation the average wait time for passengers at klia2 terminal was around seven minutes but with SITA’s efficient baggage processing technology supporting the airline agents this has fallen 40% to just four minutes and increased the capacity of this area of the airport.